My husband and I attended a convention over the weekend and this is what I wore. I knew I would be doing a lot of sitting, a lot of walking, and it was a religious event, so I wanted to look presentable. Because I would be sitting at least eight hours, I chose a pair of ponte knit leggings to be comfortable sitting that long. I wore black ankle boots with a low heel so I could walk a long distance as the convention facilities were quite large. I wore a grey Aztec print cardigan over a thin black knit top. Everything I am wearing with the exception of the jewelry is all from J.C. Penney, including my burgundy bag. I know these aren't my best fashion photos, but they were taken as quickly as possible with my IPhone. There were about 5,000 people at this convention, and finding a quiet spot to take pictures was a nightmare. But we managed to take these few snaps. This sweater was one of those purchases where "I had a coupon, and wanted to use it, but didn't know what to buy, so I bought this cardigan". At first I wasn't even sure I liked it, but it ended up being one of my favorite J.C. Penney purchases last year. I just love the fit and the style. The last time I showed you this sweater I wore it with a white T-shirt and distressed boyfriend jeans along with the exact same necklace (so funny, I didn't even realize that till I searched for the post) HERE! I love to wear silver jewelry with grey; I feel it echoes the color beautifully. 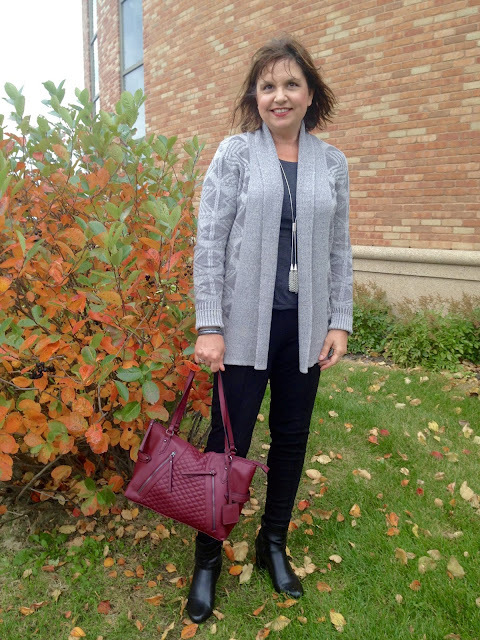 Cardigan, no longer available, similar HERE, Black Long Sleeve T-Shirt HERE, Worthington Ponte Leggings HERE, Liz Claiborne Black Ankle Boots, no longer available, similar HERE, Nicole Miller Kira Satchel HERE, and Long Silver Tassel Necklace, no longer available, similar HERE. Perfect for the event. Comfy, cute, and stylish! Have a great weekend! Love the black and gray colors with the burgundy purse! The cardigan looks perfect for this type of weather. Great look! 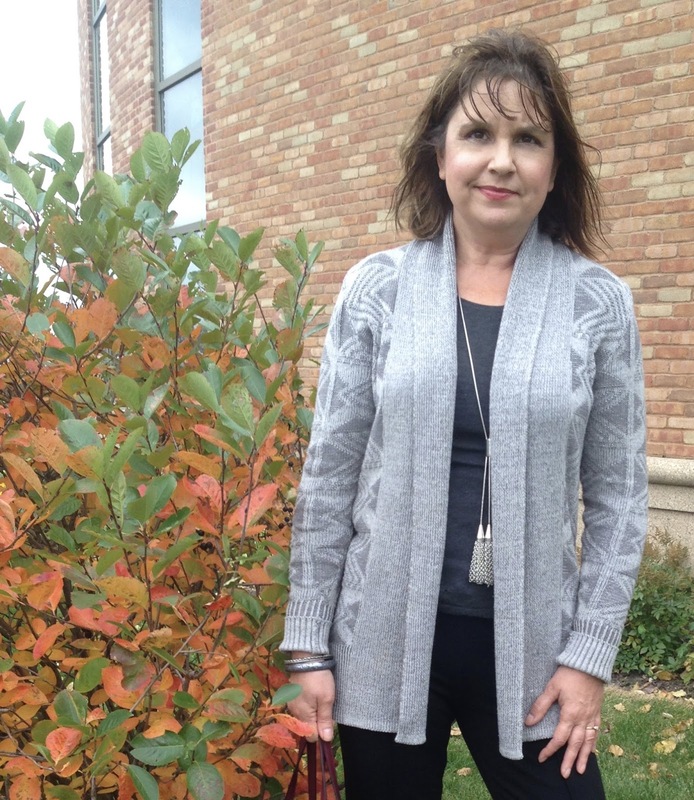 I really do like the sweater, I have those JCP coupons and at times I struggle with what to buy, too (and when you don't have a coupon, you want to buy the entire store!). The print on it is nice and subtle. I also love the color of your bag! Thanks Carrie! I'm glad to know I'm not the only one who struggles with these coupons. I love this cardigan! Isn't it funny how items we are unsure about become our favorite? It has happened to me several of times. Such a perfect look for the event. Looking good and love that necklace! Thanks so much for linking up with Fun Fashion Friday! Great outfit - it shows that you can be comfortable but nicely put together at the same time! I love cardigans like yours; they are so versatile! And the necklace is perfect with it! Thanks Andrea, sometimes too many people nearby staring bothers me and sometimes it doesn't. But in this case, people kept asking my husband if we wanted a picture taken together or saying stuff as we were taking pictures, so it was awkward. Thanks Patti, it's one of my favs! Great outfit!! Thanks for sharing at the Grace + Lace Linkup! It's smart that you think about what you're doing before you get dressed! Many of the times we went to conferences---I figured out my shoes first, because you don't want to be dead half way through the event! And don't you love it when you buy a piece of clothing that you weren't sure of---and it becomes so well loved? Thanks Jodie! I always plan my outfits ahead of time, and comfort is always my number 1 priority...especially if a lot of walking is involved. And yes, the sweater was a sweet surprise. Perfect pop of color with that bag! Love the size of it too! Thanks for linking up to Top of the World Style. Nice fall outfit!